The ubiquitous plug-in night light may soon be a relic of the past. SnapPower’s SnapRays Guidelight is a revolutionary new night light product that is fast and easy to install, and costs only pennies a year to operate. Unlike the traditional nightlight, the SnapRays Guidelight is not bulky or prone to breakage, and does not tie up an outlet. Moreover, it reduces the risk of accidental electrical shock. The SnapRays Guidelight looks virtually the same as any other electrical outlet faceplate cover and comes in three shades of color; white, light almond and ivory. However, unlike the traditional outlet faceplate cover it has three small LED lights built into the bottom side of it that function as a nightlight. The SnapRays Guidelight does not require batteries or a power cord to operate. The two power extractor prongs located on the back of the unit pull power directly from the electrical outlet to power the three LED lights. The LED lights produce 3 lumens of light, which is the equivalent of traditional night lights. The SnapRays Guidelight also has a light sensor built into it such that the LED lights automatically turn on when it’s dark in the room and turns off when it is light. With the integrated light sensor and low power LED lights, the SnapRays Guidelight draws only 10 milliamps of current. Hence, it costs only about 20 cents per year to operate, a mere fraction of what a traditional incandescent nigh light fixture costs to operate. The installation of a SnapRays Guidelight is extremely fast and easy to do, and does not require an electrician. After turning off power to the electrical outlet, use a common screwdriver to remove the old electrical outlet faceplate cover, slip the SnapRays Guidelight over the electrical outlet, and lastly, secure it in place with the same screw that was used to hold the old faceplate in place. When finished, turn power back onto the electrical outlet and the Guidelight is operational. Note: When installing the Guidelight faceplate cover, just make sure that the two power extractor prongs on the back of the Guidelight slip over the electrical outlet screws when positioning it in place. The SnapPower Guidelight has been considered so innovative that it won the “Overall Best in Show” award at the 2015 NAHB International Builders’ Show. In terms of cost, the SnapPower Guidelight is a little pricey, even when compared to the combined cost of an electrical outlet faceplate cover and a basic night light fixture. Depending how many you buy, expect to pay around $12 to $15 per unit. Keep in mind, however, that you’ll recoup the cost over the long haul due to its low power consumption and longevity of the fixture. SnapPower states that the SnapRays Guidelight LED lights are projected to last for 25 years. 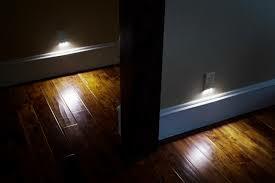 So if you are in the market for a new nigh light, or you simply want the convenience of a low profile night light, that leaves both electrical outlets available for use, take a close look at the SnapRay’s Guidelight. For more information on them visit SnapPower’s website.